North American signal crayfish were introduced to this country in the ’70s as an additional revenue for farmers to take advantage of. However, lack of experience in commercial farming methods led to them escaping where they quickly and aggressively colonised our waterways. It is by far the most successful of the six non-native crayfish now found in this country and has all but eradicated our smaller and more docile native white-clawed variety from many areas. Add to this its potential to host the fungal disease ‘crayfish plague’ which, while harmless to humans, can be deadly to the white-clawed crayfish and its destructive burrowing habits which undermine riverbanks and you will see how it might be easily considered aquatic public enemy number one. It does have one redeeming feature though as, even in the face of rudimentary culinary skills, this trans-Atlantic invader readily cooks up into a variety of very tasty dishes. 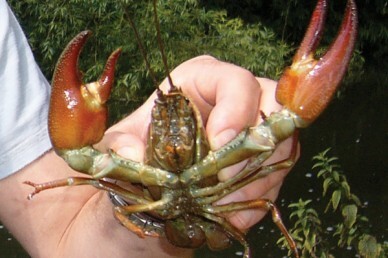 With all these facts taken into consideration you might have thought it would be open-season for signal crayfish but you still need to obtain the proper consent from the Environment Agency before heading off to catch them. 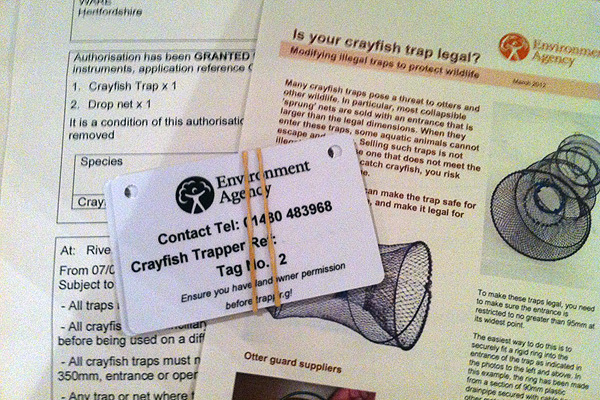 This consent is free but you will need to complete a form (Form CR1: Application to trap and/or remove crayfish) which asks specifically about the area you want to fish, when and how you intend to catch them and for what purpose. You need to apply even if the water you plan to fish is privately owned. If you intend to use traps, as opposed to hand or drop nets, they also need to meet a specification in order to avoid catching other protected creatures such as otters. You are very unlikely to be allowed to set traps where a vole population exists. If you are successful in your application you will receive consent and tags for your traps, where necessary, through the post. Remember that you will also need to obtain permission from the land owner or authority that controls the water you intend to fish. It is probably a good idea to do this first rather than be denied at a later date as, for instance, the Canals and Rivers Trust have a blanket policy of not allowing crayfishing on any of its waters. Finally, you need to tell the Environment Agency about your catches on a Catch Return Form which should come with your consent. With the formalities now taken care of you are ready to go crayfishing. An oily fish head or piece of bacon in a well placed net or trap will soon bring them thronging in – sometimes in surprising numbers. I have even seen them pulled out of a river without a net at all just clutching to a piece of smoked bacon tied to a weighted string. It is suggested that they are killed humanely at the place of capture but if you intend to eat them it is best to let them flush themselves through in clean water for at least 24 hours. If you do take them home alive remember that it is illegal to return them or let them escape back into the waterways. You will find a delicious recipe for a crayfish, mango and chilli salad here. For more information visit the Environment agency website here. 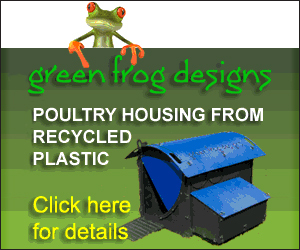 Composting: what is it and why should you be doing it?